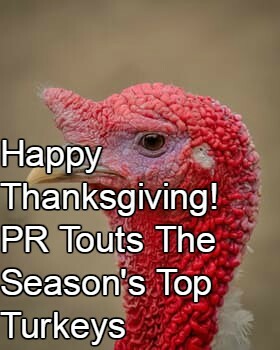 Typically public relations agencies like to count the things we’re thankful for at this time of year. These lists often include new technology-based PR tools or the latest social or other media platforms. But given these crazy times, we thought it more fitting to discuss some of the boneheaded PR moves we have seen lately. We’re also thankful for these, since they offer cautionary tales and can sometimes help us raise our game. Ryan Lochte swims into murky reputation waters. As if swimmer Ryan Lochte’s juvenile behavior at the Olympics weren’t bad enough, he then compounded it by lying to the media. Where was solid PR and reputation advice when this was going down? We don’t know, but we see evidence of a “redemption tour” as Lochte appeared on “Dancing with the Stars” — often the first stop on any path back from PR perdition, followed by the announcement of his impending nuptials. The public is a sucker for wedding stories. So, is all forgiven? Lochte will have to wait and see. Drug company CEO suffers public outrage. How did Mylan CEO Heather Bresch not learn from Turing Pharmaceutical’s Martin Shkreli’s experience? First Shkreli raised consumer ire by increasing the price of antimalaria drug Daraprim by more than 5,000 percent. His bad behavior on social media and lack of respect for a congressional investigation only made the condition worse. We wondered if maybe his publicized offer to allow someone to punch or slap him in the face was a step in the right PR direction. Yet even in the wake of Shkreli’s awful press, Mylan CEO Bresch seemed to disregard the needs of millions of allergy sufferers by authorizing a price increase of 500% for the Epi-Pen. What was her corporate communications team thinking? Bresch has yet to offer free face-punches, as her company continues to take a beating after the kerfuffle. Wounded Warrior Project hurt by reputation damage. Nothing disgusts the public like a charity cheating scandal. When respected veterans’ organization Wounded Warrior Project was called on the carpet earlier this year for mismanaging funds, the PR alarm was heard loud and clear. Top execs were accused of spending millions on parties, hotels and travel. It tarnished the reputation of one of the most revered veterans’ groups. Charity Navigator, a group that oversees nonprofit organizations, placed Wounded Warrior Project on its watch list and donations are down by 25%. In the ensuing days, WWP did retain a PR firm to help rehabilitate its rep. But it makes us wonder what their PR strategists had been doing before the crisis hit and if they knew about the malfeasance. Wells Fargo ruins reputation with cross-selling scandal. Scrooge came early this year when it was discovered that Wells Fargo had engaged in fraudulent selling practices. The bank had pressured salespeople to cross-sell to customers. When sales didn’t legitimately happen, the beleaguered staffers opened two million fake accounts in customer names. The degree of fraud was pervasive, and the damage to Wells Fargo’s reputation, incalculable. Management compounded the bad news by seeming to blame employees. Ultimately, Wells Fargo CEO John Stumpf stepped down under intense pressure. Now the bank is clawing its way back into the public’s good graces beginning with folksy new advertising. Time will tell. Google and Facebook struggle with fake news. Not all click bait leads to faux news stories, but it appears much of it does. Google, Facebook and other top sites face a public backlash over the role fake content might have played in the U.S. presidential election. The more relevant story for PR is the continued blurred lines between what is news and what is paid content. It’s troubling that it seems it matters less to some readers who get all their “news” from their favorite online sites. If we do live in a “post-truth” era as some pundits have posited, it becomes even more important for the public relations industry to continue to craft newsworthy, relevant and yes, accurate stories to engage media and readers. Both Google and Facebook have said they’ll restrict ads to fake sites, which will cut off their money stream, but Facebook in particular is still in denial about its identity – like it or not – as a media company.